NEF’s Five Ways to Wellbeing and Happy Museum thinking inspired a series of events on well-being and design at the Design Museum, writes producer Bernard Hay. One of the many changes inspired by the Design’s Museum’s move to its new home in the former Commonwealth Institute Building has been the goal to integrate a new design and wellbeing curriculum into the core of the museum’s work. The Design Museum is a Happy Museum Project affiliate and our work on wellbeing was supported by a Happy Museum Project workshop introducing staff to the New Economics Foundation’s Five Ways to Wellbeing. This work on wellbeing work led to a season of events exploring the relationship between design and well-being. Throughout its history, design has strived to improve human life, from the attempts of William Morris to improve workers conditions in the industrial revolution to the work of Victor Papanek putting environmental sustainability at the heart of design’s agenda in the 1960s. To focus our programme, we turned to design and its impact on the everyday, inviting contemporary designers to respond to the question: how can design help us to live well? Focusing on design’s influence on everyday life allowed the programme to connect more explicitly with the Five Ways to Wellbeing, with their focus on lifestyle changes and their relation to health. We began with a half-day salon of talks, discussion and live-demonstration in partnership with Imperial College London. The salon invited participants to discuss how wearable technologies such as fit-bits and diet trackers are helping us to be healthier, but also changing the meaning of healthy living into something more quantifiable and measurable. The food we eat – and the company we enjoy it in – have a profound impact on our longevity and well-being. 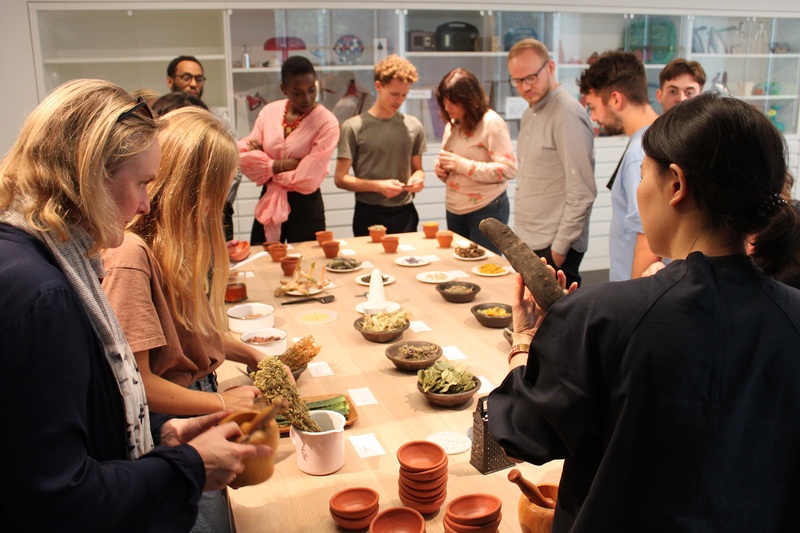 To look at the role of food we invited food-design studio Arabeschi-di-latte to lead a half-day workshop on the idea of ‘the antidote’. Exploring both mythical and medical antidotes, the group were introduced to the properties of different ingredients and historical uses of them. During the session, participants were asked to create a remedy for an aspect of contemporary life, which were then discussed collectively. Throughout our programme we recognised that the environment determines human well-being on many levels. In partnership with materials research studio Ma-tt-er, we hosted a two-day bio-textiles workshop that looked at seaweed as a design-material. Used for food, textiles, architecture and medicine, seaweed also plays a central role in creating a habitable world, contributing up to 80% of the oxygen in our atmosphere. Over two days designers, students and members of the public learnt about seaweed and the circular economy, before doing natural dying and rug-making. The programme then turned to our experience of interior space, which is the environment that many people spend the majority of their lives within. For this workshop Ilse Crawford, an interior designer and founder of the Man and Wellbeing department at Design Academy Eindhoven, led a series of workshops that explored how we create spaces that promote sleeping and bathing. This was hosted in the designer’s studio, giving participants an insight into how the designer works on a day-to-day basis. Many of the museum’s events attract a large number of designers and design student and so we also wanted to use this programme as an opportunity to engage people who are new to design. To do this we decided to make ‘being active’ a central focus of one of the events and we ran a series of yoga workshops in which a design-educator led a sequence that introduces visitors to the architecture of the Design Museum building, a grade two listed building and the former Commonwealth Institute. This was a great opportunity to also bring new visitors to the museum, who could then go on to explore the exhibitions and displays after the session. Finally, within our community strand we also delivered a five week introduction to colour in textiles design, aimed at over 60s. The programme had twelve older people from the local borough learn felt-making, textile design and colour theory. As a free course open to any older people in the borough, the course was not only an opportunity to introduce these audiences to current trends in textile design, but also to enable them to become familiar with the museum as a community resource and make new friendships. Our primary aim with this programme was to introduce participants to new behaviours and ways of thinking that they could learn from, while also showcasing some of the incredible work designers are doing in this area. We found that there was enormous appetite for events on well-being, with many of them fully booked. For the future of the programme we’re looking to embed ‘well-being’ as a longer-term project strand, using this to inform future activity. We are also currently exploring how our programmes might have a deeper impact in promoting well-being for our adult audiences and will be hosting future yoga sessions, walks and discussions on design and wellbeing. Alongside the adult learning activities on design and wellbeing, the museum’s HR team has rolled out a programme for staff that ranges from pre-work yoga sessions to promoting a dry January. 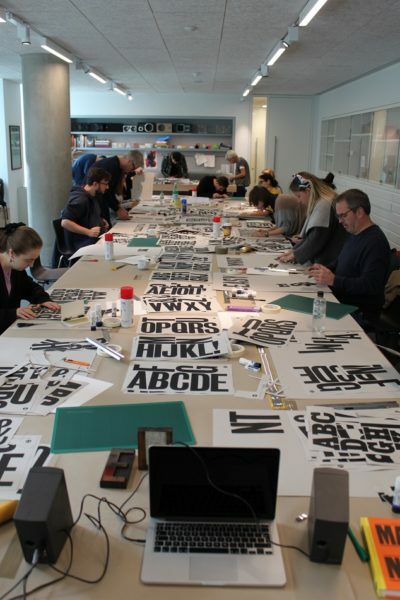 For more information on the Design Museum’s upcoming adult learning programme, please visit the website here. Bernard Hay is Producer Adult Learning at the Design Museum.